How to Select the Best Skid Steer Log Splitter Attachment? When it comes to large machinery such as skid steers, it can be a time consuming process to find accessories that suit it best. After all, quality comes first, but price is certainly a close second. When you’re looking to select the best skid steer log splitter for the money, it pays to review several different products. 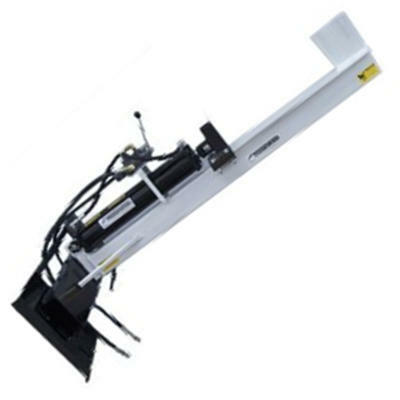 This buying guide presents four top rated skid steer log splitters on the market, all of which have the potential to meet your particular requirements to a tee. Skid steers are often used in professional, commercial or industrial environments where efficiency is key. Therefore, it’s important you choose log splitting equipment for skid steers that fit your particular work type well. There’s no sound reasoning in purchasing this kind of log splitting equipment for small residential splitting jobs, but there should also be enough work to warrant the use of a skid steer and its log splitting attachments as well. Think about your work type and ensure the work-to-equipment ratio is sound before going ahead with your purchase. Skid steers should only ever be operated by competent and potentially even qualified individuals. As they are large and often dangerous pieces of machinery, serious injury can befall those who don’t act appropriately around them. The same can be said for skid steer attachments. Large, often cumbersome and exceptionally technical, any operator needs to ensure they remain safe and use the attachments in a safe manner. In addition, it may help to wear a hard hat, gloves, protective glasses and steel toe boots when operating or using wood splitting equipment. As with PTO log splitter attachments, log splitting attachments for skid steers come in a variety of shapes, sizes, models and brands. There’s certainly no ‘one size fits all’ approach, and many are only suitable for machines up to a certain level of power – or beyond. Therefore, it’s important you review several products to ascertain whether a particular log splitting attachment is the right fit for your machine. Failure to purchase the correct attachment can result in a greatly reduced level of efficiency. The manufacturers of skid steer log splitting attachments have one goal in mind: to create a functional, easy-to-use product that will make log splitting far easier. That is why many log splitting attachments for skid steers feature 4-way splitting wedges, easy-to-attach parts, and easily accessible components which require regular maintenance. When features of convenience matter to you, it’s definitely important you pay close attention to what particular manufacturers and brands have to offer. Unlike some kinds of log splitting equipment, the maintenance of skid steer log splitting attachments is very important. Not only can lack of maintenance affect your splitter, but it can also affect your skid steer. When you first purchase your log splitting tool, you will receive the manufacturer’s guide with it. This guide will come in helpful when it comes to carrying out regular maintenance. It will list the recommended products for fueling, lubricating and oiling, but it also lets you know when you should maintain particular parts as well. Checking hydraulic lines for breakages or perishing. Checking hydraulic cylinders for leaks. Topping up all fluids in the skid steer including fuel and oil. Topping up hydraulic fluid in the cylinders as recommended in the manufacturer’s guide. Within our buying guide we have provided a selection of skid steer log splitting attachments within a variety of price ranges. In the case of log splitters, it’s important to choose the one with the best features, not necessarily the lowest price tag. If you’re looking to purchase the best skid steer log splitter for the money, carefully look at the features in comparison to the cost to ensure you truly are getting the best deal. It’s very powerful with 30 tons of force generated. 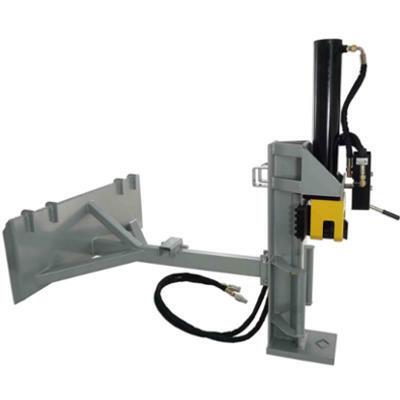 The skid steer mount plate fits a range of skid steers. It’s very easy to attach to a skid steer. For its price, it has a very poor 1 year warranty. The log ejector plate isn’t very strong and bends easily. Titan Attachments skid steer log splitter. Dimensions: 78 x 28 x 24 inches. Power Source: Skid Steer, hydraulic. Splitting Wedge: 4-way splitting blade. QDoes it have an auto-return function? Well priced on the market, this Titan Attachments skid steer log splitting attachment is a good option for many users. It’s powerful with 30 tons of force, and can accurately split long and wide logs into four pieces with relative ease. It’s also easy to attach to many different kinds of skid steers. The only thing that lets it down is its poor warranty. In comparison to the cost, you would expect it to be covered under warranty for longer. Check out what other people who purchased this product think about it. Read Titan Attachments skid steer log splitter reviews. It’s easy to attach with its quick-attach mounting plate. The skid steer’s hydraulic system operates the log splitter’s hydraulic cylinder to produce exceptional splitting force. It’s easy to switch between vertical and horizontal. It has an auto-return wedge. It has a log cradle. It’s not as affordable as other options for sale on the market. Powerhorse skid steer log splitter. Dimensions: 70 x 44.5 x 26 inches. QDoes it have a log lift? QWhat size is the hydraulic cylinder? When you’re looking for quality, you’re sure to find it in this log splitting attachment from Powerhouse. Presenting exceptional power within a durable frame, it will take care of your log splitting tasks with ease. Aside from its extensive feature list, this log splitter also comes with a generous 3 year warranty. This is a rare bonus not often offered by other manufacturers. It’s easily one of the best skid steer log splitters for the money. Check out what other people who purchased this product think about it. 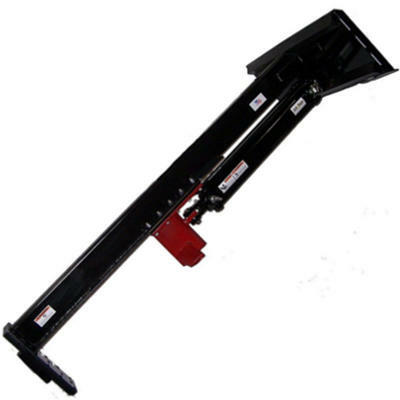 Read Powerhorse skid steer log splitter reviews. 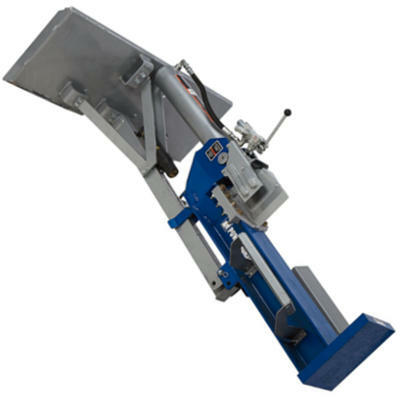 It offers 30 tons of force – ample power for commercial and industrial log splitting work. The wedge can easily be removed for sharpening or replacement. The frame is very heavy duty. It’s very unaffordable for the majority of buyers. It’s targeted to the residential sector, yet not many urban dwellers own skid steers. Ramsplitter skid steer log splitter. Dimensions: 32 x 30 x 78 inches. Splitting Wedge: 8 inch high carbon steel. QWhat market is this log splitting attachment targeted to? AThe residential market, however it’s suitable for professional and commercial use as well. QWhat is the wedge made out of? While it’s a good piece of wood splitting equipment, the target market is very confused. Ramsplitter claims it’s targeted towards the residential market, but it’s unlikely many residential users will need such a device – nor will they likely own a skid steer. Aside from the confused target market, it’s also exceptionally unaffordable. In comparison to many other skid steer attachments on the market, it’s at least $1000 more expensive without many additional features on offer. For these reasons, it’s not one of the best skid steer log splitters for the money. Check out what other people who purchased this product think about it. Read RAMSPLITTER-SSUD30 skid steer log splitter reviews. It uses all your skid steer’s hydraulic components to save money on maintaining two lots of hydraulics. It only has 2500 PSI which means you can run the loader on idle and still receive maximum force. It offers 30 tons of force. It has an emergency stop button. It comes in a range of colors when many others don’t. The 4-way wedge is an additional $100. QDoes it come with the mounting plate? Simple in construction with basic features, it’s easy to assume this log splitter won’t be suitable for all your splitting requirements. However, there’s more to this skidsteers.com splitter than meets the eye. It’s durable, exceptionally powerful and features a “no nonsense” setup. This is because all features run from the skid steer itself, rather than the log splitter. It’s well priced on the market, is a reliable brand, and is even more affordable when you choose to buy online. This top rated splitter is one of the best skid steer log splitters for the money. Check out what other people who purchased this product think about it. Read Skidsteers.com skid steer log splitter reviews. Where to Buy Skid Steer Log Splitter Attachments? While such a machine was traditionally purchased alongside your skid steer at a physical place of business, this is no longer the only option. Many buyers are cottoning on to the very real and very popular option of buying top rated machinery and products online. This extends to many kinds of wood splitting equipment. Websites such as Amazon also provide consumers with the opportunity to get the best deal.